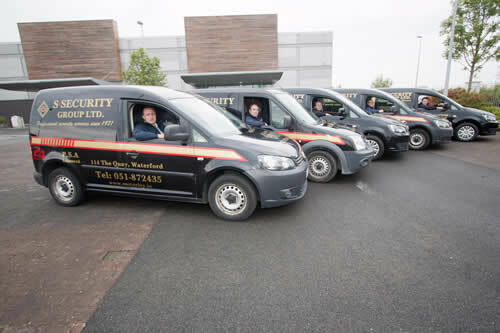 S-Security Group is a wholly owned Irish Company established in 1971. The company provides a wide range of security services ranging from Manned Guarding, Mobile Patrol, Alarm Response and Key Hold Service, Security Audits, Cash-In-Transit and Security Training and Consultancy. We have one of the largest security retail outlets in Munster stocking a vast range of security products and offering a full locksmith service and emergency callout service with two locksmiths on-call throughout the week. We currently provide services to a wide range of customers in the South East Region. Manned security contracts are in place with both private companies in the manufacturing and services sectors. We also hold contracts for services with Public Service entities. Our mobile patrol service works with a broad spectrum of customers, both residential and industrial operating in Waterford and South East counties. S-Security provides a number of products and services in order to provide you, the customer with a large scope of security services to choose from under one umbrella. Our Security team is carefully recruited, thoroughly vetted and fully trained to ensure that S-Security can provide the highest possible standards. All S-Security officers are PSA licensed. We know through experience that our security officers represent not only our company, S-Security, but also our customers. Quality of service is imperative as these officers will be working directly with our clients and the general public.